Peter Philip CareyAO (born 7 May 1943) is an Australian novelist, known primarily for being one of only three writers to have won the Booker Prize twice—the others being J. M. Coetzee and Hilary Mantel. Carey won his first Booker Prize in 1988 for Oscar and Lucinda, and won for the second time in 2001 with True History of the Kelly Gang. In May 2008 he was nominated for the Best of the Booker Prize. Carey has won the Miles Franklin Award three times and is frequently named as Australia’s next contender for the Nobel Prize in Literature. Vanessa Couchman has lived in southwest France since 1997. She works as a freelance writer, offers copywriting services to international clients and writes magazine articles on French life and the art of writing. She is a member of the online, ex-pat writing group Writers Abroad. She has also been a Writers Bureau tutor. Vanessa is passionate about French and Corsican history and culture, from which she draws inspiration for much of her fiction. Her short stories have been published in anthologies and on websites. She has also won and been placed, shortlisted and long listed in creative writing competitions. The House at Zaronza is her debut novel, to be published by Crooked Cat Publishing. Apart from her writing site, linked above, Vanessa has a blog about French life: Life on La Lune. They both write historical fiction. I am still puzzled by what people see in Peter Carey – but then I don’t like the writing of Patrick White either. How White ever got the Nobel for Literature is beyond me. I have met both of them – Carey was, at least, much the pleasanter of the two. How nice to be bracketed with a double Booker Prize Winner! The closest I’ll ever get…I’ve read a number of Carey’s books (Oscar and Lucinda, Jack Maggs, Kelly Gang) and liked them to varying degrees. I love the off-the-wall characters, although I find his writing style quite hard to get into sometimes. Like cat and jom, I have never been able to get into Patrick White. Thanks for featuring me, Miriam. Will reblog onto my writing site. 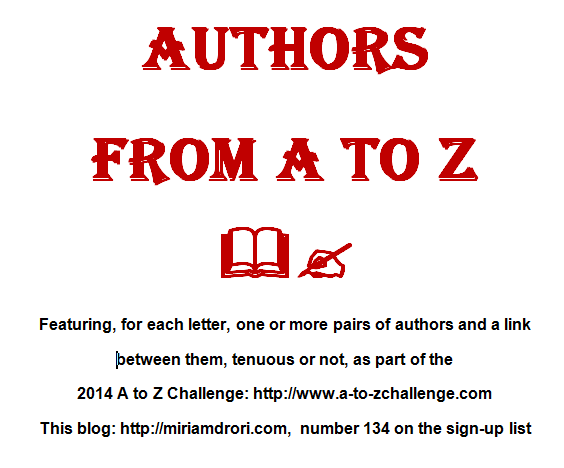 Fellow Crooked Cat author Miriam Drori is taking part in an A to Z challenge to pair authors for each letter. Today, I’m bracketed with double Booker Prize Winner Peter Carey. I hope you’ll enjoy The House at Zaronza – will probably be published end July, so not out yet. Reblogged this on There You'll Be. I’ve never heard of them before. Maybe because I’m not that interested in historical fiction.